Edward Burtynsky is a large format landscape photographer known for his beautiful, often sublime, photographs of the altered landscape. His photographs are saturated and depict different landscapes that result from extracting natural resources and now, water. His new film Watermark, co-directed with Jennifer Baichwal, follows his obsession with water usage over ten countries. This is Burtnsky’s second film with Baichwal. She was the director of the 2006 film Manufactured Landscapes, a film that chronicled landscapes of extractive industries and manufacturing. Watermark is a visual essay that records Burtynsky’s movements around the world in a series of vignettes. 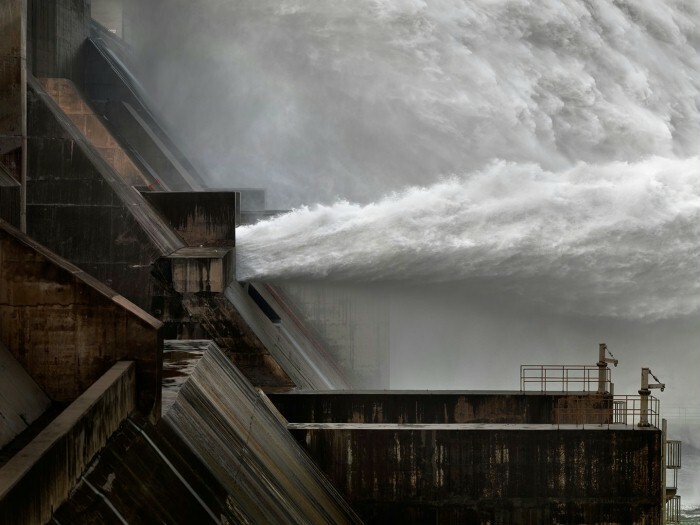 The film begins with a slow motion shot of a massive wall of water being released at the Three Gorges Dam, an annual event that releases the built up silt behind the dam walls. The footage from the Dam fills the frame, creating an abstract composition that is both beautiful and terrifying. Aesthetically the water is reminiscent of Romantic paintings of the early nineteenth century, the work of James Whistler and Joseph Mallord William Turner immediately come to mind. As the camera starts to pull out, the viewer is shown the scale of this water release and a small group of tourists posing gleefully on a concrete viewing platform, the rolling brown water roaring behind them. Through-out the film, almost every shot is treated like the silt release. Viewer’s are shown close-up views of events occurring and then the camera is slowly moves from ground to sky. It is an attempt to show the vastness of these projects and landscapes. Through-out the film, Baichwal and Burtynsky return to China: meeting abalone farmers on the Fuijan coast, construction workers at the Xiluodu Dam project on the Jinsha River, and a family of farmers tending their generations-old terraced rice paddies. In Dahka, Bangladesh viewers are shown the leather tanning industry and in India, an annual pilgrimage to the Ganges. During a visit to Greenland, the film documents scientists drilling ice core samples for climate research and in British Columbia, a tour of the pristine mountains. The film also takes a helicopter ride in Texas farmland, and looks at the results of a depleted watershed. Brief glimpses of the now-dry Colorado River Delta in Mexico and Owens Lake in California are also presented. These scenes are interspersed with footage of him working in his studio in B.C and with his printer, Steidel in Berlin. The film sets up a number of obvious binary relationships: East/West, man/nature, destroying/preserving, developed/developing. These binaries are essential to the Western construction of landscape. Diving further into landscape histories, water usage becomes less binary and more complicated than the film loosely tries to narrate. Land and water use is a global concern, however part of the global concern is to recognize the history of industrialization and development of global capitalism, particularly in relationship to extractive industries and colonization. Acknowledging this history is important in addressing an issue as complex as water usage. In this film there was a definite tendency to construct an Other of both China and India. It is telling too perhaps that African and South American landscapes do not appear in the film at all. The aerial views of landscape and nature, favored in this film, are over simplified in formal abstractions, which coincide with a Western-tradition based on the idea that Nature can be controlled and that humans are separate and above their environment. Humans now live in a world that faces increasing environmental pressures and social crises that are often overshadowed by the power relationships between nation-states and capital. Under these conditions lacking a grounded critical or historical analysis, the works run the risk of being banal. Watermark suffers for prioritizing the image over the message. While Watermark is beautifully shot and worth watching, like Manufactured Landscapes before it, it definitely misses its mark. The photographer’s watermark is their signature, and likewise this film is marked by its message lost behind the sublime imagery and fragmented narrative of its creators. 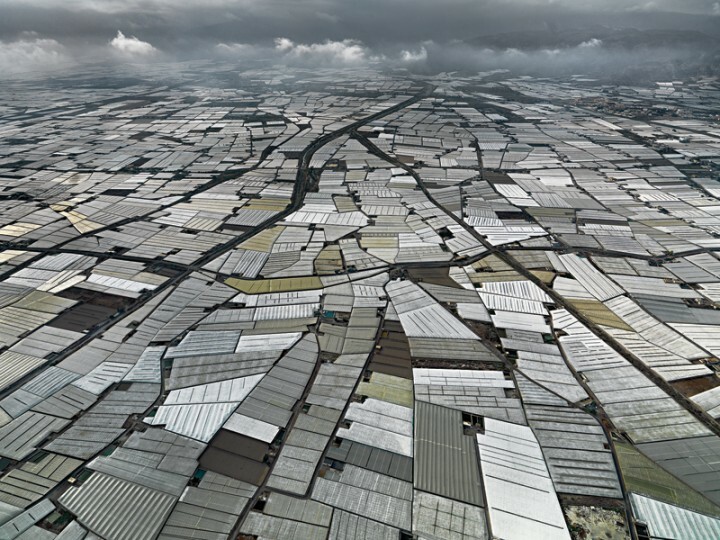 Throughout the journey Burtynsky’s point-of-view remains aerial, from anywhere he wants to be, and in this way from a very privileged and hardly acknowledged vantage point. Despite the engrossing beauty of the production of his images, his simple lament for nature is symptomatic of humans larger problematic relationship to the planet. Watermark is currently screening at select theatres across North America. i. See Water Wars (2009) or Blue Gold (2008) both documentaries about the struggle for water and especially the high-profile case in Bolivia. ii. Watch his video called “Where I Stand” for a behind the scenes look at the film and his perspective on it.